A “W” is one of the most coveted statistics in the game. A W represents a win; a triumph over the opposing team. The “Inverted W” on the other hand, is quite the contrary. During the live chat a few weeks back, Nick brought up an interesting article from Chris O’Leary entitled “Death to the Inverted W“. 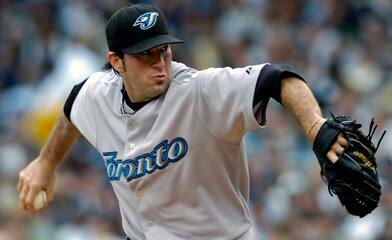 I noticed that Shaun Marcum was featured prominently in the article. Intrigued by the mention of one of my favourite pitchers, I decided to venture a little further into the rabbit hole. 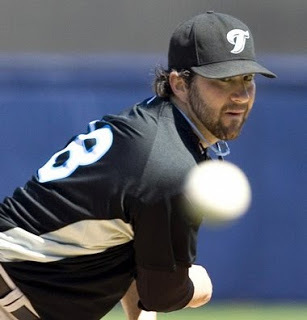 Taking a look at the photo above, you can notice that Marcum is a candidate for the Inverted W delivery, which can be defined as when the pitcher’s elbows are above the shoulders at the point of delivery to form an upside down W.
“I believe that pitchers who make the Inverted W are at a significantly higher risk of experiencing shoulder, and in some cases also elbow problems. I don’t think the Inverted W is bad in and of itself. Instead, the problem with the Inverted W is that it can create a timing problem where the PAS (Pitching Arm Side) forearm is not in the proper, vertical position at the moment the GS foot lands and the shoulders start to rotate. It increases the distance and force with which the PAS upper arm will externally rotate. This increases the stress on both the elbow and the shoulder. As soon as I saw the word impingement, I immediately thought of Scott Richmond. A shoulder impingement was the injury he initially suffered back in July, and now has him on the 60-Day DL. Sure enough, after looking through the photos, Richmond shows signs of the Inverted W. Albeit not the textbook case, his pitching arm side does not raise very high above his shoulders, but it does occur. But he’s not the only one. Although Brian Tallet did not suffer from any injuries last year, the photo below indicates that the Inverted W could lead to one in the future. I asked Chris if the injury to Scott Richmond and possibly Brian Tallet in the future could be attributed to the Inverted W.
“The Inverted W doesn’t seem to cause injury in and of itself. What it does is increase the likelihood that the pitcher will develop a timing problem and thus put more strain on their elbow and shoulder. Thanks to footage and pictures, maybe we can predict which pitchers are more susceptible to injuries than others. Strangely though, members of the Blue Jays pitching staff have seemingly dropped one by one due to major injuries. I was very curious as to the congregation of injuries to the Blue Jays pitching staff. Just in the past three years, Shaun Marcum, Dustin McGowan, Jesse Litsch and formerly B.J. Ryan all succumbed to major injuries. Some believed that former pitching coach Brad Arsnberg was in some way responsible for the demise of the Jays young arms. Chris suggested it could actually be attributed to the scouts. “I have often wondered if someone inside the Blue Jays is actually selecting guys because they have the Inverted W. They just seem to congregate in the Blue Jays more than in any other organization, which makes me wonder if people are either drafting or signing pitchers for it or teaching it. Whether or not the Inverted W actually increases the likelihood of injuries in players remains to be seen, but from what I’ve read and seen on the subject in the past few weeks, I’m a believer. You’re dealing with muscle memory, which can be VERY hard to overcome. I’ve had a few youth level guys who were taught the Inverted W, and I wasn’t able to get them to transition to a better arm action. There’s also the question of motivation, given that the pitcher very well may lose a few MPH and thus some effectiveness. That possible level of performance reduction is a very hard pill for a pitcher to swallow, especially if he’s still able to survive in the big leagues. So what can we take away from all this information? Basically, it serves as a warning to pitchers and their coaches; if it’s evident they have a Inverted W delivery, they could be much more susceptible to injuries than their counterparts who do not. It appears that trying to alter a pitcher’s delivery is like trying to teach them to pitch with the opposite arm. In this particular situation with young pitchers, it’s much easier to be proactive than retroactive. If they have already been accustomed to their delivery, then there’s not much the pitching coaches can do about it. Unfortunately, those mechanics are something pitchers can necessarily re-learn or avoid, so it could be a slippery slope for young hurlers that demonstrate the telltale signs of the Inverted W.
Anon, Chris' website is filled with tons of great articles. He also covers the "Inverted L", which can also lead to injuries as well. For someone who doesn't work in the medical field, he is extremely knowledgeable on the subject. Great read. I'd be very interested to know if it's taught by the Jays organization or whether they were intentionally drafted. I doubt scouts would look for it as they are looking for the best pitcher regardless of which school of mechanics they come from. Obviously they are looking for good mechanics but doubtfully only one kind. Anon, I'm glad you liked it! Mattt, it could be either of those things you mentioned, or possibly just pure coincidence. Chris said that the Inverted W does give pitchers a few more MPH, so maybe the scouts were looking for that delivery all long. Ian…my fist post to alert your readers to his background. Although I won't also say hogwash, I will caution you…he doesn't have a background in baseball. True, but it's definitely some interesting food for thought. I'm not saying that the Inverted W will eventually lead to a substantial injury. It's just something to consider when we add up all the injuries to the Blue Jays pitching staff over the past 3-4 years. Very illuminating post, Ian. While anon summarily dismisses this as nothing substantial, which it very might be, the increased number of Tommy John surgeries on the Blue Jays staff and general shoulder maladies over the last few years indicates a multitude of theories as to why that is the case. It seems like a combination of scouting, coaching, and stubbornness on the players themselves for the injuries, especially after posts such as yours. I'm not one to singularly blame Brad Arnsberg because that's too simplistic, but he doesn't seem like one to correct arm mechanics either. In any case, awesome perspective and entry. BK, in my mind this is just one theory of why those injuries keep happening to pitchers on the Jays pitching staff. I thought the Inverted W was an interested take on things. I would never point the finger at Arnsberg – if anything, he should be commended for turning around Ricky Romero and working his magic with Rzep and many others. This just in….throwing a ball 90mph puts a lot of stress on the arm and its joints. Injuries may result, the humerous may snap. And try throwing without a W sometime. oh and the worst part….an inverted W is an M numnuts. True – tossing 170 innings year after year will wear on a pitcher, but maybe the Inverted W makes them more prone to injury. I didn't come up with the name, but they should have called it the M or something different. Maybe the Inverted W sounds more dramatic. So, it wasn't Arnsberg's fault? No, I guess it wasn't all Arnie's fault, but unfortunately there's always a scapegoat when stuff like that happens.